Classes and workshops are available for professional level, student groups, community or theatre groups. Workshops are tailored to suit the group and their needs. 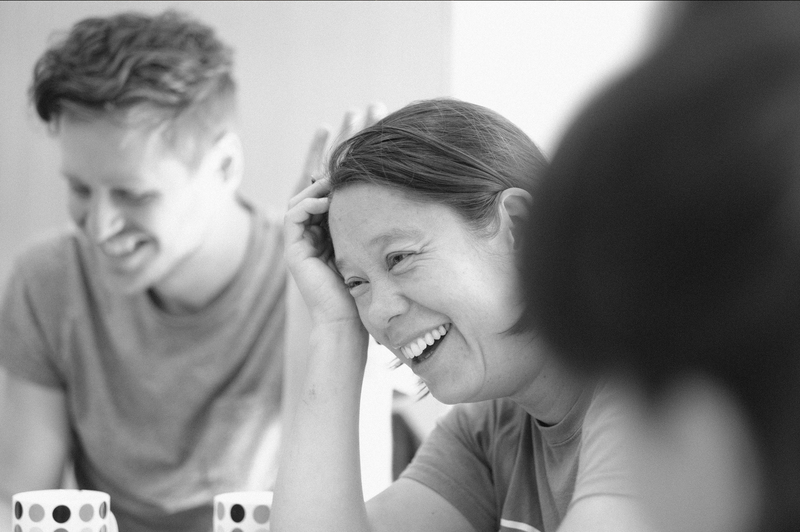 Jo regularly works with inclusive dance and theatre groups, elders groups and people who simply love to move. 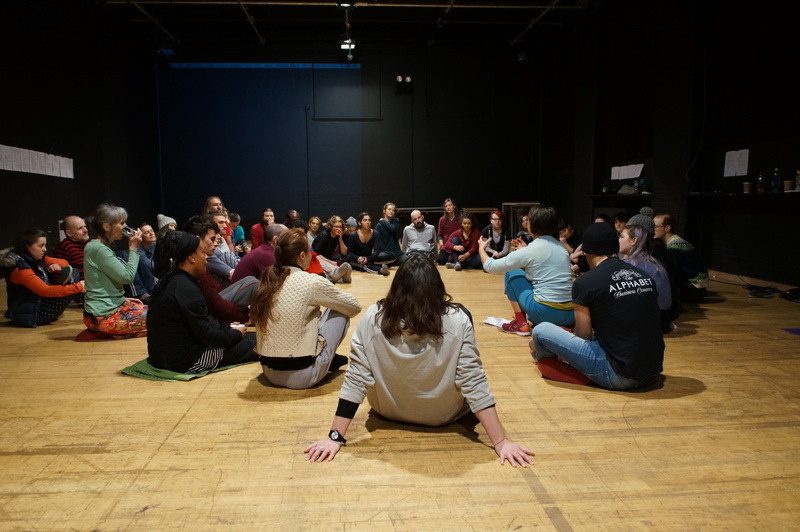 Sessions can be centred around repertoire material, creative experimentation for choreography, movement for theatre practitioners or improvisation techniques. Workshops give an insight to the creative methods of Jo’s work and offer invaluable advice and feedback. Classes Jo’s working practice is an evolving, interactive and a playful approach. Play has become the very nature of how Jo approaches her body, her voice, her performance roles and her making processes. In the studio-based sessions Jo shares the instigations and the receptive and active techniques. An efficient, imaginative and dynamic approach. Ways of Being Together is a series of workshops, discussions and performances centred around the idea of Belonging – A Sense of Belonging. 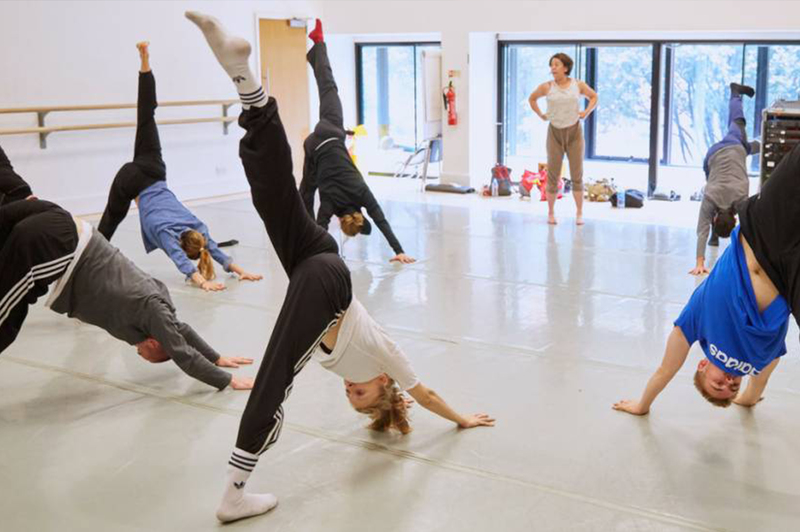 Jo leads a warm-up/class followed by pair work, group work and games that she developed as part of the creative process for a new work for Cardiff Dance Festival, Nov 2017. This study is currently being developed for a re-creation entitled Assemble for CAN Festival in London, Jan/Feb 2020. The intital workshops took place in October 2018 as part of China Changing at Southbank Centre, London. Studio time is part of a larger conversation about community, participation, inclusivity, integration and rather than sustaining something, a body, a practice, a career… thinking about what it is to thrive both individually and as a community. Embedded in the all the gatherings have been the notion of belonging. A sense of belonging is intimate and powerful, connected, optimitstic, unknown and curious making. At this time it seems essential to work on our Ways of Being Together. We walk, we talk, we listen, breath, see, observe… Dance has a special place in this face to face, touch, respond – hearing ourselves, each other, being seen, the value of our bodies, movement, presence, proximity, growing a physical sensitivity and our own physical power. A great deal of this practice is about meeting people well. As a language Jo has been developing a self generating score, simple instructions / games that play out, encouraging awareness, listening, range, presence and also simple acts like noticing. 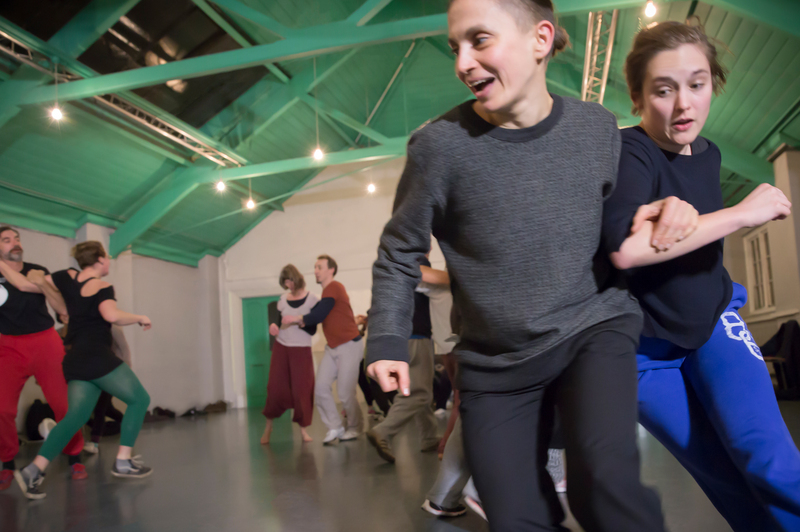 Workshops based on current work take the form of guided improvisations and function especially well with mixed groups flexing our ability to move with others. Initially the warm up is about relationships with our own bodies and voices following individual and inherent desires. Working from the inside of the body to the outside the process incorporates a sense of play, listening, response and investigation. Jo’s practice is influenced by her eclectic experiences in many dance and theatre making processes and performance. Barry Ganberg, Head of Musical & Choreographic Studies, Rambert School. Jo regularly teaches professional level classes at National Dance Company Wales and lectures at the Royal Welsh College of Music and Drama.